As you practice AntiGravity techniques you not only become more efficient with your movement and more confident about physicality, but you will become lighter! AntiGravity has two meanings 1) playing within the laws of physics 2) against graveness -- in other words, keep moving, stay light-hearted and have fun! When you laugh you are working your risible muscles. In AntiGravity we are intent on keeping them in shape. When you open up space in your body, you open up space in your mind. When you open up space in your mind, you release judgment and regret and are able to experience life and pleasure with abundance! Open Up. Be Free! Live AntiGravity! Fitness techniques are not just for those who are physically gifted. It is my personal opinion that everyone has a duty to themselves and society to do their best to care for their body and mind. Our true wealth is our health. It has been my desire to make AntiGravity accessible to anyone who is sincerely pursuing health; the technique is easily modified to accommodate all fitness levels. The first step in fitness is choosing to be physical, get out of your comfort zone and burst through your standard box. When you come to an AG class, you get to leave life behind and take care of YOU. All the challenges of the day diminish and you remember your true essence. Just by showing up you are already victorious. Inspiration is the key to sticking with a fitness program. AntiGravity® is a creative technique based on a movement art form that is meant to inspire fitness. The process should be rewarding, not only based on the physical results, but also on the satisfaction of creative accomplishment. Your workout is a personal practice of awareness. In your pursuit of health, do your best, no better no less. Learn how to "Monitor Your Resistance" according to how you are feeling on any given day. We are constantly chasing potions for youth and have learned how to hide our wrinkles, however, it is our posture, agility and ease of movement that often shows our age the most. We are only as young as our spine is flexible and our mind is open! Open up, be free and discover the real fountain of youth through AntiGravity! Use it or lose it! As the body ages, in order to combat the aging affects of gravity: the joints need to be pushed to maintain mobility, the muscles need to be worked to maintain proper alignment, proprioceptors need to be sharpened to maintain agility and the vertebral discs need to be hydrated to minimize deterioration. Use it or lose it! Although man was not born with wings, the dream of flight is primal to humans. Greek Gods & Superheroes fly through the air. AntiGravity stems from that dream. My desire is that you should leave class feeling for a moment that you have "slipped the surly bonds of earth", sprouted wings and realized the dream of flight. Yoga is the practice of awareness, of body, mind and spirit. It is a physical practice with a philosophy. 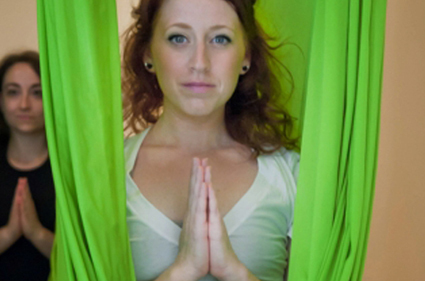 AntiGravity Yoga (prati gurutva) is a technique created by borrowing from both the moves and the philosophy. The primary philosophy is presence. Finding €œpresence" by living in the moment is the true objective of a yoga practice. In the present moment you are safe and in flow with the universe. Cradled in your Harrison AntiGravity Hammock it is easier to come to yourself. Here is where you experience what great yogi's call ananda --- and we call joy. Since the beginning of time our first form of entertainment has been drums and fire. To this day musical rhythms and lights rule. As an AG fitness instructor you are also a DJ. Music is integral to inspiration, creating mood and establishing the right vibe for the specific class. Silence is also encouraged intermittently at appropriate times.